Located in Western Canada, in the province of Alberta, is the city of Calgary. Known for its extreme weather patterns, Calgary endures hot summers and cold winters, rain and thunderstorm in bulk masses and occasionally—but not exceptionally —damaging hailstorms. Within the city lies the luxury retirement community of Aspen Woods, owned by Amica™, Canada’s most innovative operator of seniors’ retirement residences. As the first Amica residences in Calgary, Amica at Aspen Woods was developed to provide residents with a welcoming and upscale community. Its range of resort-like services and amenities include an indoor AquaFit pool, on–site theatre, fine dining, spa services and much more. Designed by award-winning Calgary-based architecture firm, Marshall Tittemore Architects (MTA), Amica at Aspen Woods is a four–story building comprised of 147 rental suites and over 32,000 sq. ft of amenity space, including outdoor terraces, dining areas and a landscaped walking trail. Though the stick frame building initially incorporated a conventional wall assembly, Amica and MTA wanted to explore options for building façade to help enhance its use and prevent moisture infiltration. Amica retained the services of JRS Engineering, one of the Pacific Northwest’s leading building envelope consultants, through MTA to evaluate the façade and provide product and solution recommendations. “While the original assembly followed building code, we recommended the team at MTA incorporate some sort of moisture management solution, as the climate can change so drastically. We would like to see projects in Alberta start adopting rainscreen applications,” said Joel Schwartz, Principal of JRS Engineering. To find a solution, the team contacted Benjamin Obdyke, a leading provider of high-quality roof and wall building solutions. Benjamin Obdyke representative Peter Grant, Grant Agencies – Canada, worked with Amica, MTA and JRS to create several mock-up options so they could evaluate how a moisture management system could be incorporated with the building’s selected siding. Ultimately, approximately 45,000-square-feet of Benjamin Obdyke’s Home Slicker® Plus Typar® and 10,000-square-feet of Home Slicker® Stone & Stucco were specified for the project. Two products from the Home Slicker family of rainscreens were chosen for the project based on the types of sidings specified. First, Home Slicker Plus Typar was selected for application behind areas with fiber cement clap board. Recognizing that fiber cement siding absorbs water, Home Slicker Plus Typar will deliver the combined benefits of a rainscreen and water resistive barrier behind the siding. Each roll contains the patented Home Slicker three-dimensional matrix bonded to Typar, the premium residential and commercial grade housewrap by Fiberweb Incorporated. This combination allows moisture to drain and dry quickly before it damages sidewall materials and protects the wall assembly from mold and rot. Amica at Aspen Woods was also clad in a mix of stucco with some cultured stone at the base to create a rigid structure. Benjamin Obdyke’s Home Slicker Stone & Stucco, a vertically channeled rainscreen designed for use with manufactured stone, natural stone, stucco and masonry applications, was used on the main floor of the property. Containing the patented Home Slicker three-dimensional matrix bonded to a fabric, Home Slicker Stone & Stucco is able to prevent mortar from entering the wall cavity during cladding installation to maintain a space for drainage and ventilation. 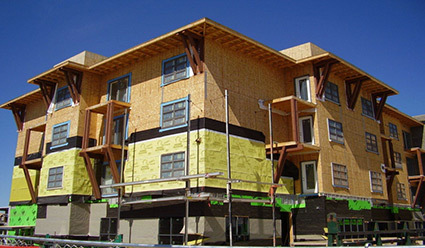 All Home Slicker products were created to comply with new Canadian building codes. Installation of the Home Slicker products went smoothly. In fact, both the Home Slicker Plus Typar and the Home Slicker Stone & Stucco saved time and labor costs by eliminating the need for furring strips, while still maintaining a space for drainage and drying of the wall system. Benjamin Obdyke has been providing leading rainscreen solutions since the early 1990’s, offering product innovation, premier performance and value. The Home Slicker rainscreen solutions effectively extend the lives of commercial and residential buildings, using the technology to effectively act as a means for moisture management. By creating an air space between the back of the cladding and the face of the water resistance barrier, the rainscreen is able to reduce the forces that draw water into the assembly. Water that is blocked from reaching the back of the cladding drains from the air space. The rainscreen system also accelerates the drying of moist air that accumulates in the interior wall assembly by moving air throughout the cavity.